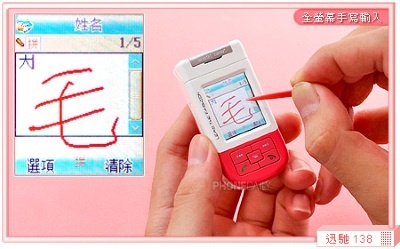 Online Store Found For World's Smallest Cellphone, The Xun Chi 138 | OhGizmo! We reported on the Xun Chi 138 a while ago. In case you missed it, this device claims to be the world’s smallest cellphone, with dimensions at 55 grams and 2.64 (67mm) inches long. It features a VGA camera with video recording & webcam, a video player, photo editor, MP3 player w/EQ settings, voice recorder, 121 MB of memory, a 260,000-color touchscreen, multimedia messaging, WAP browser, GPRS, calendar with multiple alarms, handwriting recognition, vibrating alert, games, calculator and unit converter! The thing about it, is that it was notoriously hard to find a place to purchase. Until now. A fine reader of ours has found an online store that seems to carry stock, and ships worldwide. But there’s a problem. The phone will only GSM networks in Europe, Australia and parts of Asia, but unfortunately will not work on North American GSM networks such as Cingular/Cellular One, T-Mobile, Rogers, Fido/Microcell, SunCom, Dobson, Edge Wireless, Alltel, Petrocom, Union, Pegaso/Movistar, Radiomovil/Telcel etc., since the frequencies used in North America are different than in Europe and Asia. You can go here for a list of supported countries. If you can purchase, it’s $235 plus $15 for worldwide shipping. We’re not vouching the site, since we’ve never seen or heard of it. But any inquiries can be sent to smyers22 at lycos dot com. Wow! My very own posting on Ohgizmo!